Intervention in Brazzaville 13th December 2001 (...) Any African worthy to be called African does not have the right to remain Christian. What is Christianity? Oh!, I do respect Christians... when they stay at home..., that is to say in Rome..., that is to say in Europe. But here you have been converted by force. Your ancestors were converted by force... To be Christian when you are an African is to betray your ancestors. Become Raëlians! I will launch a big apostasy campaign. I hope you will apostatize from the Christian religion, because it is the religion of the colonizers, the slave owners who have looted, stole and abused you and continue to do so. If you abandon the Christian religion you can choose to become atheist (it’s your right), or nothing (you are not obliged to become Raelian), or you may become Muslim (because this at least is not the religion of your colonizers), whatever you may like, everything except Christian. Because to be Christian, is to send an insult to your ancestors who have suffered, who have been converted by the use of the stick, and whose children were taken away from them in order to put into schools by force. This is what it is to be a Christian! 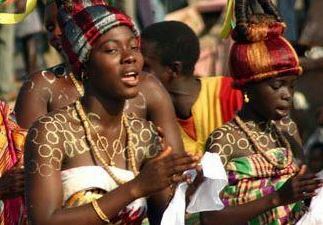 How can one be Christian and African? This has always surprised me! This is because you say to yourself that the “whites” are superior... No, this is wrong! Stand up! Be proud, be great, be yourself! There were many local religions in the past, in your cultures which the colonizers, in their big disrespect of your cultures have called animist or primitive religions. Find your roots and go back to them while embracing the sciences of the future which will make you, not equal, but superior to your ancient colonizers. Intervention in Brazzaville 14th December 2001 (…) All this is possible. There may even be a greater chance than you imagine. Why? Because Western countries have handicaps that you don’t have the handicap of “ethics.”. You must abandon “ethics.” Be aware, because this issue could spring up here. Their “ethics” come from traditional religions, such as the Catholic religion. I want us to launch a big planetary campaign of apostasy in countries which have been colonized. Here is the clear message to get to your brothers and sisters of Africa: “How can you be a Christian, given what the colonizers have done to your ancestors? When you are Christian, you make your great-grandfather who is watching you from the sky cry. Because your great grandfather and your great-grandmother have suffered under the Christian colonizers. They were converted by force, they are up there, they are watching you and they are thinking: how can they go to the church of those who have massacred us? How can they? Think of your ancestors. The best way of making them happy is to apostatize from the Catholic Church. This church which so tortured your ancestors, forcing them, separating them by force from their family. I apostatize. I bear them no malice, I forgive them, but you see, I have decided to no longer be a member of the Catholic Church. Sign your act of apostasy and add - “In memory of my ancestors, whom you have converted by force” - then send it to your bishop”. This message must be sent - this is a must! And you can also, after this apostasy, choose to have the privilege of being Raelian, to belong to the Raelian Movement, which is not, which has never been, and which will never be a colonizing religion. It respects all groups, all ethnicities, and all differences. It wants each small group, each small ethnicity to shine all its lights. It is in favour of one world language, another aspect of the fight for dignity. Intervention in Accra (Ghana), Decembre 2004 As a result, this African revolution shall come from the basis, from the people and from you. Spread these messages around you. Regain your culture, regain your religion.(...) You are there to revive them, find back the original religions in what constitute their greatness. in « Assessment of the 50 years of Kama independence », interviewed by DRTV of Brazzaville 14th November 2009 (…) At the religious level, Africans have to understand that their ancestors have been colonized, tortured and massacred in order to force them to accept colonization; they have also been tortured, massacred and ill-treated so they would change religion. Conversion to Christianity has been done by force and by violence. African people, the ancestors you have, are still alive on the Elohim’s planet. They are watching you, and they see their descendants, you, dressed like their tormentors; they are desperate! If you want to find the truth again held in the cult of your ancestors, annul your baptism, apostatize from the religion of the colonizers. And then, your ancestors will look at you with pride, saying, look, finally, our descendants are independent at last. But for now, you are not. They make you believe in independence, there is a flag, government leaders: they are puppets, at the orders of international powers, and you know it, who take a maximum amount of money and put it in Swiss bank accounts while Africa is starving to death mostly everywhere. One example is the basilica of Yamoussoukro, it is an aberration! An American woman has just launched an operation that I had initiated over 30 years ago, telling the Vatican that if they are so concerned with the poor, with hunger in Africa and elsewhere, why don’t they sell the Vatican and with that money everyone can be fed! Because this Christian religion which values they praised, with which you were colonized and that always said “poverty is beautiful, to possess nothing is beautiful”. OK, so do it yourselves! May the Pope sell the whole Vatican, it is a city! And with that money, there is enough to feed all of the Africans for over a century. But NO, they remain in luxury while in African churches, they continue to preach poverty, humility... these are jokes! It is the sequel to colonization. So, if you managed 1% of political decolonization, that is to say a mockery, spiritual decolonization itself has never been done. You continue to mimic Europeans by dressing like them, by renouncing your values and your traditions. You continue with everything! A religious decolonization is a must. Apostatize, annul your baptism. Send a massive amount of letters to churches saying I repudiate my baptism, I go back to the religion of my ancestors so they may be proud of me. That’s it! So, for the decolonization of Africa it is a waste of 50 years, but it is not too late to start.